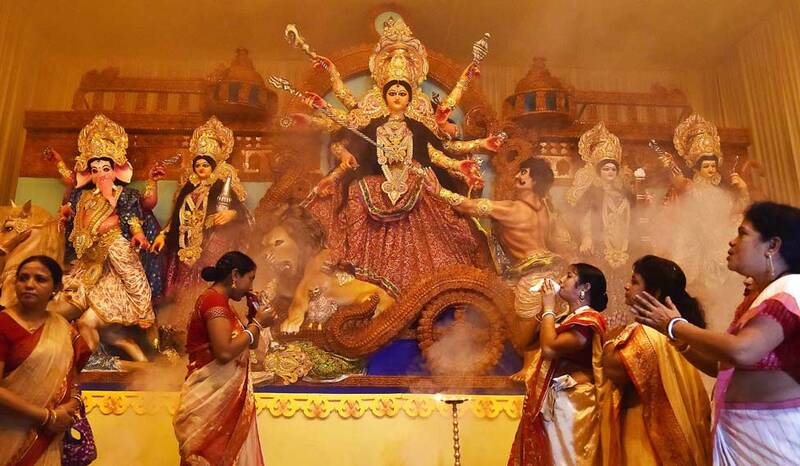 Durga Puja, the biggest religious festival of the Bangalee Hindu community, has begun today with the incarnation (Bodhon) of the Goddess Durga on the day of Maha Sashthi at temples across the country amid stringent security. On the occasion, preparations in all the Puja pandals have been completed across the country to mark the festival. In separate messages, President M Abdul Hamid and Prime Minister Sheikh Hasina conveyed greetings to the members of the country’s Hindu community marking the festival. The five-day festival starts with ‘Bodhon’ of the Goddess Durga tomorrow while the celebration will come to an end with the immersion of the idols of the Goddess Durga in the nearby rivers and water bodies across the country on October 19. To mark the Shashthi today, recitation of the verses from the Holy Chandi and blowing of conch shells (Shankha) and beating of dhak- dhols (drums) are being heard in temples and pandals. The Shashthi puja began through Kalparombha at 6:30 am. Maha Saptami puja will be held on Tuesday, Maha Ashtami, Kumari Puja and Sandhi Puja on Wednesday, Maha Nabami Puja on Thursday and Bijoya Dashami on Friday. Bangladesh Puja Udjapan Parishad General Secretary Nirmal Kumar Chattarjee said as many as 31,272 permanent and temporary mandaps have been erected in the country, including 234 in the capital city this year. In Dhaka city, the largest number of crowd of devotees will be seen at Dhakeshwari National Temple, Ramkrishna Mission and Math, Kalabagan, Banani, Shakhari Bazar and Dhaka University Jagannath Hall puja mandaps. Security has been beefed up in all Puja pandals throughout the country, including the capital, with the deployment of additional squads of Ansars, police, RAB and other law enforcers for peaceful celebration of the festival. Besides, voluntary groups will also perform duties at the puja pandals. “Law enforcers including police, RAB and Ansars will remain deployed for five days from the first day (tomorrow) at all Puja mandaps across the country until the immersion on October 19,” Home Minister Asaduzzaman Khan Kamal said earlier. He also said the government has banned the use of crackers and all sorts of drugs during the Puja. Social networking sites would also be put under surveillance so that no group could spread rumour to destroy communal harmony ahead of the Durga Puja, the minister added. All Puja committees have installed close circuit cameras and metal detectors at their mandaps. A mood of festivities has been witnessed among the devotees irrespective of ages marking the festival while adequate security measures have already been taken in the puja pandals across the country. Draped in new dresses, a large numbers of devotees of all ages will throng the city pandals, particularly at Dhakeshwari National Temple, and offer prayers before the Goddess Durga seeking peace, prosperity and welfare of the country and its people. Apart from offering prayers before the Goddess, Dhakeshwari National Temple at Lalbagh has chalked out other programmes including rendition of devotional songs, distribution of clothes among the poor, distribution of Mohaprosad, Arati competition, voluntary blood donation and bringing out a Bijoya Dashami procession in the city from the temple premises. Preparations have also been completed in the tastefully decorated Puja pandals at Ramkrishna Mission and Math, Ramna Kalimandir O Anandamayee Ashram, Kalabagan, Baradeshwari Kalimata Mandir, Siddheshwari Kalibari, Bholanath Mandir Ashram, Jagannath Hall, Rishipara Gautam Ashram, Gulshan Banani Sarbojonin Puja Parishad, Basabo Balurmath, Bonogram, South Maishundi, Shankhari Bazar, Tanti Bazar, Panitola, Farashganj, North Brook Hall Road, Lalbagh and other places in the city. On the eve of the festival, leaders of Bangladesh Puja Utjapan Parishad, Mahanagar Sarbojonin Puja Committee and Bangladesh Hindu-Bouddha-Christian Oikya Parishad expressed Puja greetings to the members of all communities of the country.